Some short covering was witnessed in Thursday’s session as the benchmark Index NIFTY50 stopped its 6-day losing streak to end in the green. The NIFTY ended the day gaining 88.45 points or 0.87% though not before paring some gains from the high point of the day. The Markets failed to capitalize on the strong opening it enjoyed in the earlier trade. However, the short covering took the Markets higher later on. Going into trade on Friday, we still need to approach the Markets with caution. It is likely that the Markets enjoy good opening again. However, it is just not completely out of the woods. Markets will have to crawl above the 10275-10300 zones and it would also need to see that the current short covering that it witnessed gets replaced with fresh buying. In Friday’s trade, the levels of 10275 and 10320 will act as immediate resistance levels for the Markets. Supports come in lower at 10210 and 10150 levels. 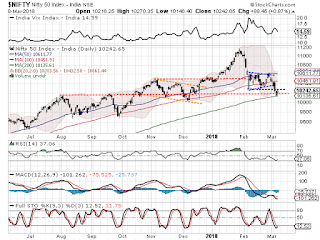 The Relative Strength Index – RSI on the Daily Chart is 37.0612 and it remains neutral showing no divergence against the price. The Daily MACD stays bearish while trading above its signal line. On the Candles, a white body with long lower shadow emerged. 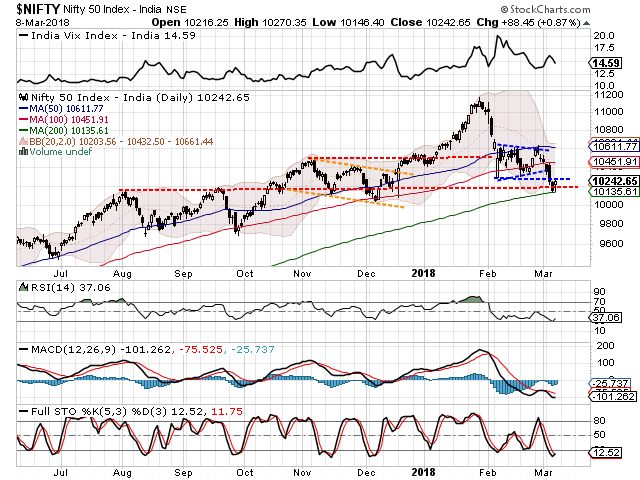 It remains significant as it occurred near important support area of 200-DMA. This has capacity to potentially mark a bottom. This also needs confirmation on the next trading day. While having a look at pattern analysis, the NIFTY has given a downward breakout from the 10276-10300 support area. In the attempts to find bottoms, it has tested the 200-DMA support levels twice intraday. Overall, there is no doubt that the Markets have attempted to take support at its 200-DMA and has defended it twice. However, this effort will get confirmed only after the NIFTY moves past 10275-10300 resistance area. Until this happens, it will theoretically continue to remain vulnerable to volatile selling bouts. We recommend traders to refrain from creating major short positions. Longs, however, should be taken very selectively as well. Cautious outlook is advised until the Markets establish a clear directional bias after confirming a bottom for the immediate short term.